AminCat DBU ( 1,8-Diazabicyclo(5.4.0)undec-7-ene ) is a clear, light yellow liquid of relatively low volatility which has C9H16N2 as chemical formula. It has only a slight ammonia-like odour, is miscible with water and is soluble in most organic solvents. (1,8-Diazabicyclo(5.4.0)undec-7-ene) is also known as 2H,3H,4H,6H,7H,8H,9H,10H-pyrimido[1,2-a]azepine. Europe and United States: Provided AminCat DBU ➔ on stock in our local warehouses. Our lead time is about one week if delivered in 200 KG steel drums. AminCat DBU catalyst is used mainly for specialised applications requiring very strong catalysis. These applications include formulations containing alicyclic or aliphatic isocyanates, which are much less active than aromatic isocyanates and require exceptionally strong catalysts. The product is recommended for evaluation in integral skin semi-flexible foams and microcellular systems. Store 1,8-Diazabicyclo[5.4.0]undec-7-enein cool, dry and well-ventilated area and in line with legal requirements. Keep AminCat DBU away from heat sources and oxidizing agents. A Material Safety Data Sheets (MSDS) is available for AminCat DBU and all other products supplied by Vesta Chemicals BV. This substance (CAS: 6674-22-2) has been registered (FULL) under REACH (EC) 1907/2006. 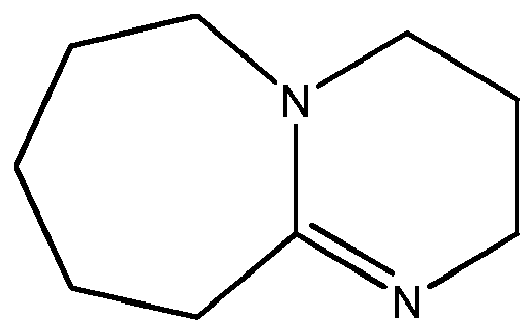 1,8-Diazabicyclo(5.4.0)undec-7-ene | CAS: 6674-22-2 | Disclaimer. This information is supplied solely for informational purposes and Vesta Chemicals bv makes no guarantees or warranties, either expressed or implied, with respect to the accuracy and use of this data. All product warranties and guarantees shall be governed by the Standard Terms of Sale. Nothing in this document is legal advice or is a substitute for competent legal advice.